The 20th edition of the Quivering Quads Trail Race will be held on Sunday, March 3rd, 2019. The original QQ, held in 1994, incorporated race distances of 10 kilometers, 13.1 miles, 50 kilometers, and 50 miles. In celebration of the 20th running, we are bringing back an original distance, the 50K ...for one year only (maybe)! This year’s event will feature a completely new half marathon course and both courses will feature incredible Ozark-like bluff views. Participants will choose from multiple swag options, including a flocked sweatshirt, BOCO trucker hat, and more! Half marathon finishers will receive a custom topographical themed medal and 50K finishers will receive a custom wood belt buckle The post-race party will include great food, cold craft beer, music, awesome awards, and much more! Half marathon registration will be limited to 500 and the 50K will be limited to 100. Please reference below for distance cutoff times before registering. LOCATION AND COURSE - NEW 2019 COURSE! Cuivre River State Park is located in Troy, Missouri. Runners are sent onto the race course in waves of 25 that have been seeded according to their predicted pace for a road half marathon. This year’s event will feature a completely new half marathon course and both courses will feature incredible bluff views. Along the course, runners can expect wide fireman roads, narrow single track trails, rolling hills, steep climbs (but not too many), and numerous creek crossings through the bottomland forest of Big Sugar Creek. Participants should also expect to experience your average midwest rocks, roots, mud, along with some spectacular wildlife. The striking views along the course will remind you of the famous Missouri Ozarks. The course offers new challenges for every level while enjoying the amazing scenery. Participants of the 50K will complete two loops. Loop #1 will be ~17.9 miles, and loop #2 will be the half marathon course of 13.1 miles. Limited course support will be available during loop #1, and 50K participants should plan to sustain themselves during the first loop. Please reference cutoff times below. Dogs are not permitted on the course or in the race. 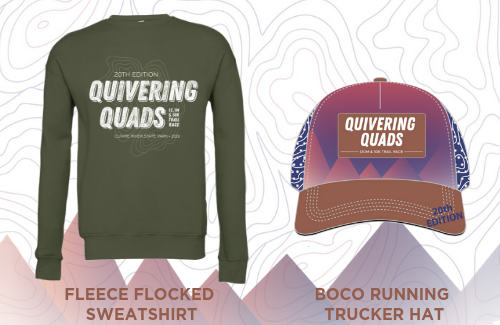 BOCO Running Trucker Hat: New style of BOCO Gear hat to celebrate the 20th edition of QQ! All the comfort of a run hat with the style of a trucker – running trucker has structured front panels and a trucker visor with breathable laser cut panels. Fully customized 6-panel construction featuring laser-cut side and back panels, adjustable back velcro closure, sublimation design, curved bill, wicking internal sweatband, and more! One size fits most. BOCO Hats are limited, and first-come, first-served when registering. Participants can choose to purchase additional hats for $24 each ($30 value). Heavyweight Fleece Flocked Sweatshirt: The custom blend sweatshirt with feature the topographical logo with vintage flocking technique. Available sizes are XS to 2XL. Those who register by February 10th will be guaranteed a race shirt in their size. Shirt sizes are first-come, first served for those who register after February 17th. REGISTRATION & FEES - To avoid overcrowding the trail, the half marathon registration is limited to the first 500 entrants. The 50K registration is limited to the first 100 entrants. Refunds are available until 30 days of the event date. Processing fees are non-refundable. BOCO Hats are limited, first-come, first-serve when registering. Half Marathon Awards will be given to the top three male/female overall finishers and the top three male/female in the following age groups: 19 & under, 20-29, 30-39, 40-49, 50-59, 60 & over. If you are coming from out of town and cannot pick up your packet until race morning, please carefully read over the Race Instructions (coming soon) before race morning. Your swag and race number will be waiting for you at the race start. Loop 1 (~17.9 miles) must be completed in 4.5 hours to continue onto loop #2. VOLUNTEERS | Interested in volunteering for Quivering Quads Trail Race? All volunteers will receive a custom QQ BOCO Hat or Sweatshirt and a gift card to Fleet Feet, along with refreshments and lots of thanks and praise! Have a group interested? Contact Jules (jules@fleetfeetstlouis.com) for more information and details. REFUND and TRANSFER POLICY | No refund within 30 days of an event. No make-up date or refund if the event is canceled due to weather. Entries are not transferable to another event but can be transferred to another participant. Transferring registration is allowed until 2/25/2019. TRAINING PROGRAMS | And if you're looking for a fun way to best prepare yourself for QQ, our 13.1M Rock Runners program will prepare you for the QQ half marathon, and our Distance Project program will get you ready for the QQ 50K. Come run with us! Trail Half Marathon | The Fleet Feet Running Club's 13.1M Rock Runners program is a 12-week program that will take members off the road and onto St. Louis' best trails as they prepare for March 3rd's Quivering Quads Half Marathon. Training begins on December 10th. Learn more. 50K Trail Distance | Our 50K Distance Project is a 16-week program designed for runners looking to move beyond the marathon and to the 50k (31.1M) ultramarathon. Members train to adapt to the increased mileage and learn how to fuel for extreme distances. This program begins November 12th and culminates at the March 3rd Quivering Quads 50k. Learn more. QUESTIONS? | Contact Jules (jules@fleetfeetstlouis.com) or call our Race Productions office at 855-786-5945 x716. SPONSORS | Interested in becoming a sponsor? Contact Jules (jules@fleetfeetstlouis.com) for more details about sponsorship opportunities! The Troy Area Chamber of Commerce, Visitors Bureau has graciously contributed to the race budget and will be reaching out to provide more information about Troy Sites, Restaurants, Activities, and Accommodations available before and after the race. You can contact them at office@troyonthemove.com for more information. QQ was endorsed in 2014 by Outside Magazine, who named it one of the six best Outside running races. In 1994, Fleet Feet Sports hosted the inaugural Quivering Quads Trail Runs within the boundaries of beautiful Cuivre River State Park. The unique event incorporated race distances of 10 kilometers, 13.1 miles, 50 kilometers and 50 miles. 175 runners entered the inaugural event, which immediately became a fixture on the St. Louis area’s running calendar. By 1998, QQ was the largest trail run in Missouri and an event of some national prominence. The race was regularly featured in Ultrarunning Magazine and earned a mention in Kirk Johnson’s 2001 book To the Edge, which documented the world of ultramarathoning. The race went into hiatus after 2003’s 10th annual event so that Fleet Feet could attend to the growth of their Lewis & Clark Marathon and Half Marathon, which became Rock ‘n’ Roll St. Louis. In 2010, QQ returned as the Quivering Quads Trail Half Marathon.